Today's blog goes out to one of my favorite neighborhoods next to the Stonebridge Potomac Town Center, Potomac Club. Although it is not an exact science, I will do my best to answer the sought after question, "How Long Will It Take To Sell My House In Potomac Club?". As a Woodbridge Va Realtor, there 2 questions I get all the time, "how long will it take to sell my house?" and "how much it my house worth?". Recently, I sold a property in Potomac Club at 2139 Abbottsbury Way #495 Woodbridge, VA 22191 PW#9587928. 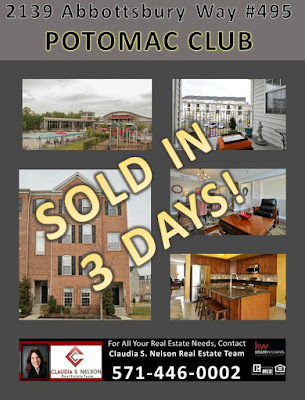 I sold this lovely 3 bedroom, 2 1/2 bath townhouse style condo in Potomac Club in 3 DAYS!! This prompted me to write this blog for you on, "How Long Will It Take To Sell My House In Potomac Club?" Let me be clear in saying the answer to the title of this blog is not 3 days. The answer is in choosing a Realtor® that has the experience to represent you well, the knowledge of your neighborhood and surrounding areas to price your home right the first time and a Realtor ® that has a strong internet presence and systematic approach to marketing your house. This is the basic foundation to getting your house to sell fast in Potomac Club and basically the new rules of marketing real estate in 2016. These statistics are provided by MRIS. These are all the listing sold or under contract in Potomac Club since January 1, 2016. 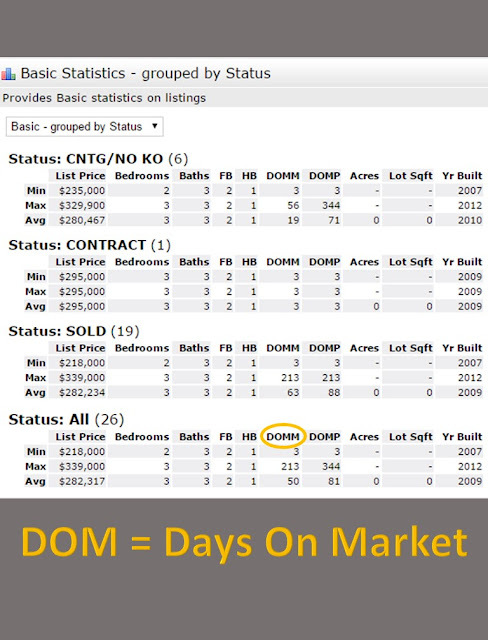 The average days on market for Potomac Club is 50 days. Keep in mind this is an average of all Real Estate agents an the methods they use to sell homes. You can also see the average list price is higher that the average sold price. This has to do with the experience of the agent and pricing it right the first time. If selling your home quickly is important to you, then you also need to remember the advice of your Realtor®. Just like the home at 2139 Abbottsbury Way #495, Woodbridge VA 22191 that sold in 3 days in Potomac Club. I know Potomac Club well. 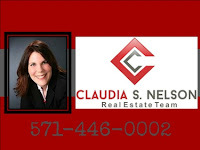 I know how to price homes right and what they need to get sold quickly. When you are ready to sell your Potomac Club home, call a Real Estate Agent that is not only the top Realtor® with Keller Williams in Woodbridge but an agent that knows Potomac Club. 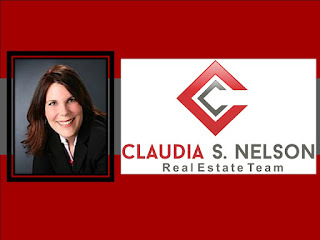 Claudia S. Nelson has helped many Potomac Club Home Buyers and Sellers and is familiar with Potomac Club,Woodbridge and surrounding. 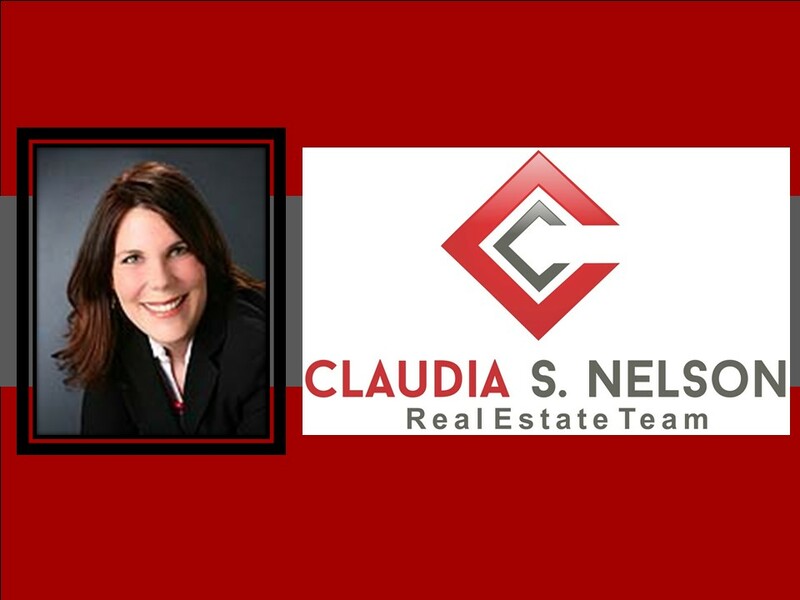 The home selling and buying process can appear to be a daunting and complex undertaking, but, you can rely on Claudia’s knowledge, experience, and know-how to assist you from the beginning stages of the process to settlement! This entry was posted in Claudia S. Nelson, Keller Williams Woodbridge VA, Sell Your Home Fast, Woodbridge Home Values, Woodbridge VA and tagged blog, Claudia S Nelson can help, How Long Will It Take To Sell My House In Potomac Club Woodbridge VA. Claudia S Nelson, MRIS # PW9587928, Ready to sell your potomac club Woodbridge home, Woodbridge VA Realtor by claudianelson. Bookmark the permalink.